Renowned Swedish audio brand, JAYS, is finally back with a sequel to our much beloved a-Jays Four that we've reviewed back in 2011. 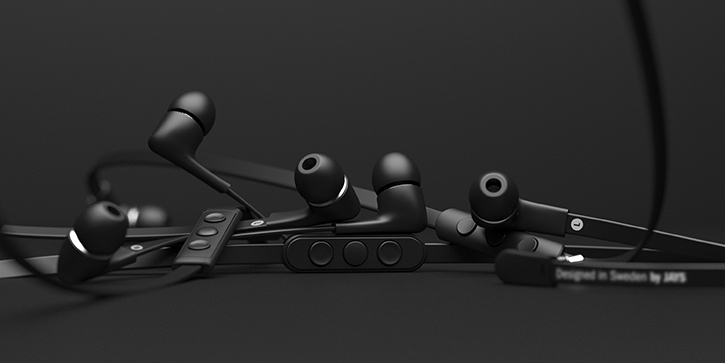 The a-Jays Five are a totally new pair of in-ear headphones that have a durable one-piece rubberized construction that prevents cable strain, and which is also ergonomically shaped to fit the geometry of your ear canals. What's more, JAYS has improved its already incredible flat tangle-free audio cable which launched with the a-Jays series years ago with even more durability. And of course, the a-Jays Five feature redesigned custom JAYS drivers similar to those found in the a-Jays Four but "with powerful and precise bass but with even more dynamics and improved details in the midrange and highs". Using a high performance MEMS technology, the microphone consists of an acoustic sensor, a low noise input buffer, and an output amplifier. The built-in echo cancellation makes the audio perfect in nearly all situations. It reduces surrounding noise and, best of all, unlike many other microphones, this one won’t degrade during time as it recharges the mic-magnets each time you connect your earphones to your phone. JAYS wanted to bring compatibility of its award-winning, fully featured 3-button remote and mic with MEMS technology module to all popular smartphones and not just the iPhone this time. The a-Jays Five will be available in three models, each with its own custom 3-button remote and mic module designed to work specifically with either iOS, Android and Windows Phone 8. JAYS also improved upon its a-Jays Four remote which we thought was one of the best control and mic combination ever put on a pair of headphones. The a-Jays Five's in-line remote module is now slimmer by 20%. JAYS has yet to announced an availability date, but one thing we now for sure is that the a-Jays Five will retail for $100/€90 in matte black and white.